This confirms that Gomez caught each of these 390 balls. Note that we can also calculate statistics when Gomez was playing CF, including the groundout-to-air out ratio of the Brewers, and the batting average on balls in play of their opponents. As we saw before, we can use the plot() method to visualize where Gomez’s catches were on the field. 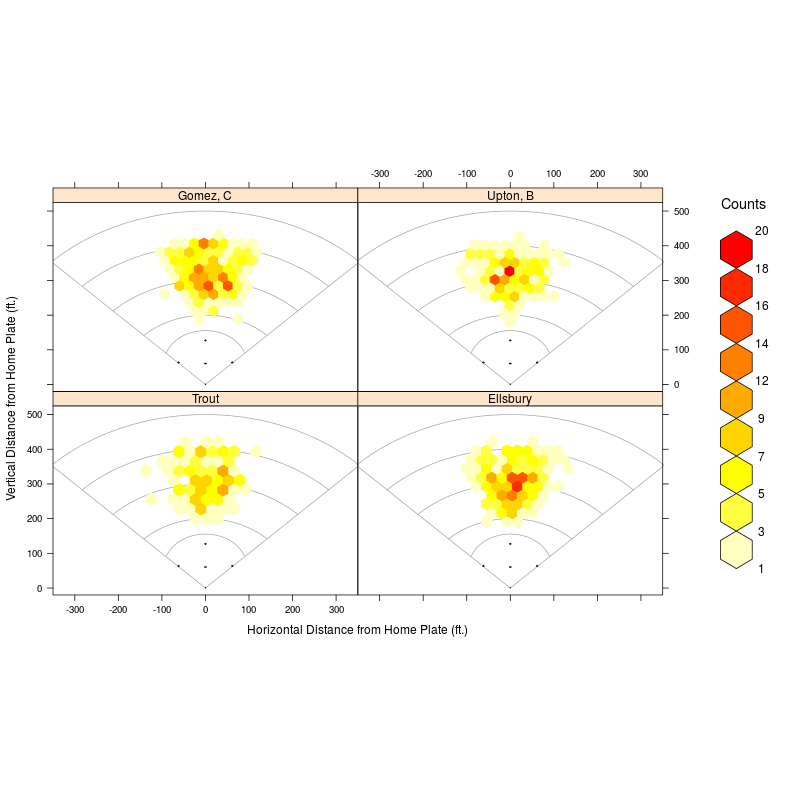 While this plot has the advantage of showing us the individual balls that Gomez caught, it can sometime be hard to visually aggregate these data. A hexbin plot will do that for us. Let’s try a simple hexbinplot(). This plot, while a technically accurate representation of the data, is nearly meaningless because the data is not presented with any context. This is a common problem in statistics – let’s see if we can solve it. In this case, the lines that illustrate the baseball diamond in the previous plot would really help us to understand the locations these hexbins. Luckily, this generic baseball diamond is drawn by the panel.baseball() function in openWAR. 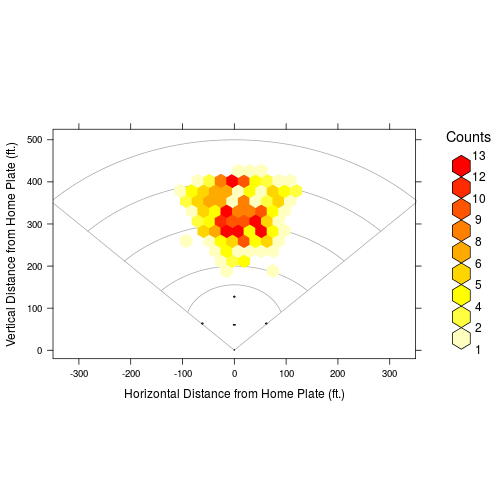 If you are familiar with lattice graphics in R, panel.baseball() works like any other panel function – it simply adds this baseball layout to your plot. 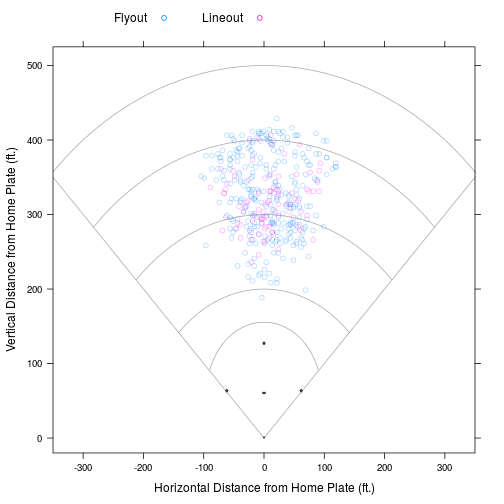 What’s great about this is that you can use panel.baseball() to overlay this field onto any lattice plot, and hexbinplot() happens to be a lattice plot. So for example, we can put the baseball diamond onto the hexplot quite easily. That actually worked, but it didn’t help much because the margins are not wide enough, we didn’t label the axes, and the hexbins are too small. Also, we can add color and change the number of colors used. A few tweaks will improve things considerably. 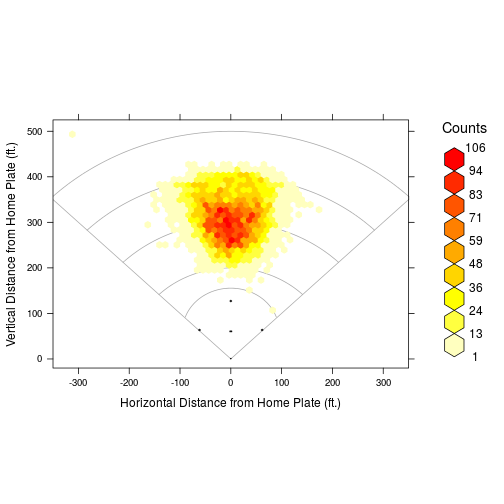 , xlab = "Horizontal Distance from Home Plate (ft.)"
, ylab = "Vertical Distance from Home Plate (ft.)"
Of course, we’re interested in how Gomez compares to all centerfielders. It might be more instructive to compare him to a handful of other centerfielders. Note that we have not controlled for playing time here. Unlike Goldsberry’s charts, where the variable being plotted is a percentage, what we are plotting here is just a count. In effect, the hexbin plot is a binned, two-dimensional, color-coded histogram. Wow, those are great plots! 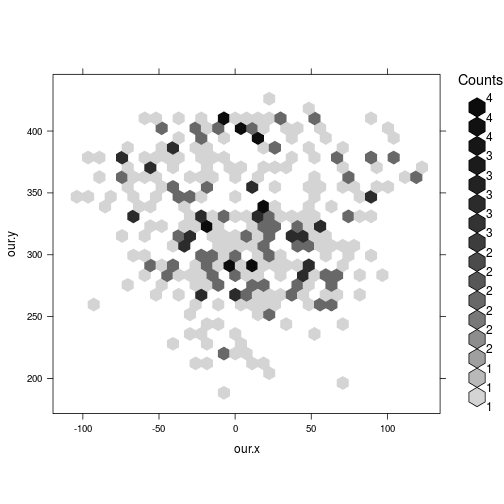 Even thou I do not follow baseball (was here looking for examples on the usage of hexbin), I really liked the plots. Congrats!